Since their discovery over seventy years ago, antibiotics have been our leading weapons in the treatment of bacterial infections, including life threatening infections in hospitals. Often, they are routinely prescribed and taken, sometimes inappropriately. Antibiotics are also used in the food animal production for therapy, disease prevention and growth promotion. However their transforming powers are under threat because their indiscriminate use has triggered antibiotic resistance, and in many cases they no longer work. Antibiotic resistance is an expected and natural mechanism and refers to a situation where an antibiotic that normally would stop growth of a certain type of bacteria no longer does that. 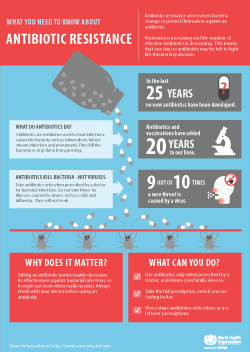 Use and misuse of antibiotics in both humans and animals can make bacteria resistant. Furthermore resistance can be transmitted between humans, between animals, and between humans, animals and the environment. Transmission and spread of bacteria or genes that carry the resistance information can occur in hospitals, in the community, and through the food chain. Antibiotics have also been found in the environment, for example in some water supplies. Infections from resistant bacteria can be difficult and sometimes impossible to cure, and they are increasing. Meanwhile, research into the development of new antibiotics that will work is very costly and lengthy, and resistance often develops rapidly after new antibiotics are marketed. Currently, very few new antibiotics are in the development pipeline. Without new and effective antibiotics, but with increasing resistance, society could return to the conditions of a pre-antibiotic era, when a simple lung infection could kill a child, or when doctors could not fight meningitis. A number of advanced medical interventions and diagnostics would also be impossible because of the lack of effective antibiotics for prophylaxis. Every year in the European Union alone, an estimated 25 000 patients die because of a serious resistant bacterial infection acquired in hospitals. Infections from resistant bacteria are a serious problem in health care settings, causing life-threatening infections in the blood stream, pneumonia, wound infections and others. Antibiotic resistance increases the costs of treatment because of longer hospital stays, more expensive antibiotic drug use and treatment, as well as indirect costs to families and society. In many countries in the European Region, antibiotics can be bought over the counter. Often data is not collected on antibiotic resistant infections, so although doctors are very well aware of the problem, its scale is not being charted.